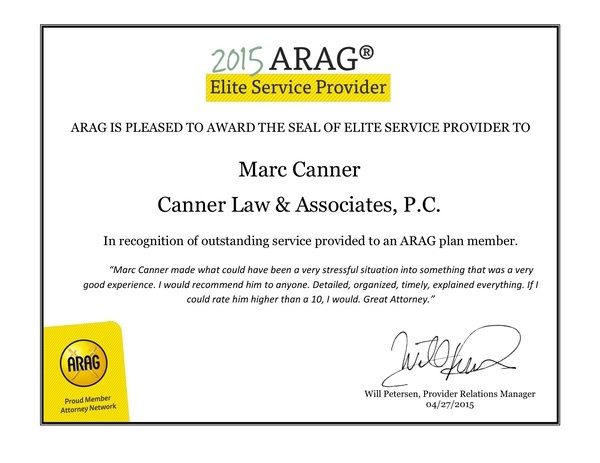 Testimonials in praise of Canner Law & Associates, P.C. Great experience working with Atty Goldman and his team. Questions were answered faster than I could have hoped for and I was aware of where we were in the process on their end. Atty Goldman was easy to talk to and even ask the “stupid questions”. I plan to use them again for my next house as well as refer them. This was a very smooth transaction. Attorney O'Sullivan helped make this an easy closing. He was knowledgeable, pleasant and professional. – Margie Roberto – Agent with Boardwalk Real Estate Corp. December. 2018. We want to thank Karin for taking to time to provide us such a nice review on YELP! Click to read how he helped Michael out with his new home! We want to thank Ben for such a kind review of our team! This is my fourth time using Canner Law and Marc Canner in my home buying process. I won't use anyone else. Marc and his team are an asset in the home buying process, make everything smooth and carefree. Thank you! Click here to see the review on REDFIN! We just bought a house and Marc and his team (Marc himself, Nicole, Joe and everyone else we spoke with along the way) were unbelievable. They were quick to respond to any question (however small or complicated), they helped with the mortgage process, and they connected us with an insurance broker that was wayyyy better than the brokers I had been speaking with before that. Click here to see the review on YELP! 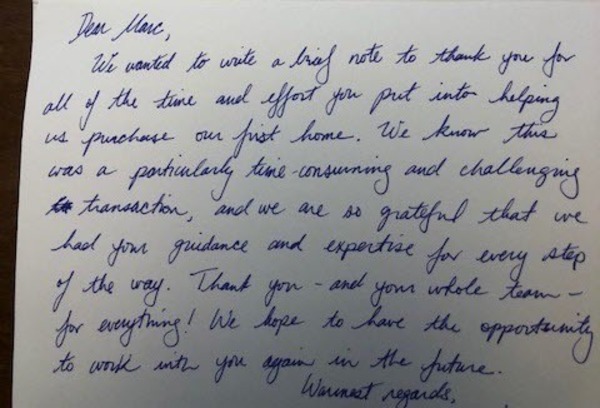 A hand-written note from a Buyer who bought a property in Boston in 2018. Dana, thank you for everything and please thank Marc for us. You have made a very difficult process so much easier. Thank you, again. We've enjoyed working with you. Expertise reviewed 159 real estate law firms in Boston, and picked the Top 19. The criteria for selection included: reputation, credibility, experience, availability, professionalism and engagement. We are honored to be recognized. Thank you to my entire team, our terrific vendors, title insurance partners, and of course, the talented and dedicated realtors and mortgage originators we work with who helped Canner Law make the list of top real estate law firms in Boston! – Thank you Alex!– See review here! Our family had a long-distance, unexpected estate sale in Massachusetts. The process had the potential to be messy given the probate situation. However Marc and his associates were all incredibly responsive, helpful and professional in representing us on all sale needs and helping us through this difficult process which went smoothly and successfully as a result. I would highly recommend Canner Law. I was very impressed and very grateful for both their professionalism and also their personal touch in guiding us through. Marc and his team were extremely helpful and made the confusing law process easy to understand. He and his team made sure I understood each step. They were easy to keep in contact with and answered any questions that came up. Super responsive and on top of his game! Marc Canner and his team put clients first and are committed to problem solving to ensure the real estate deal comes through. My wife and I were relocating from Connecticut to Massachusetts and Marc immediately set clear expectations for the home buying process in our new state. He worked through the Purchase & Sale Agreement to ensure all our conditions were met and caught a number of issues in the document submitted by the seller’s attorney. His team also provided an above and beyond level of service for our closing. Our lender had an issue with the Master Insurance coverage for our condo and Marc worked to first convince the Homeowners Association (HOA) that they needed the coverage the lender was asking for and then to help the HOA buy a new Master Insurance Policy that fit the lender’s criteria. Despite stubbornness among parties involved, the deal closed and Marc and his team were instrumental in pushing it through. Throughout the process they were quick to respond to both phone calls and e-mails. A big THANK YOU to Marc and his team, which is very highly recommended. I had the pleasure of working with Marc and his firm twice this summer - first with the purchase of our house and then with the sale of my condo. Marc has such a patient, calm demeanor which put me completely at ease during a very intense and often stressful process. Marc is professional, knowledgeable, thorough and available - essentially everything you want in a real estate attorney. I highly recommend him and the entire team. Canner Law represented me during a recent condo purchase in Arlington, MA. I found Canner Law to be extremely responsive, detail oriented, and thorough. 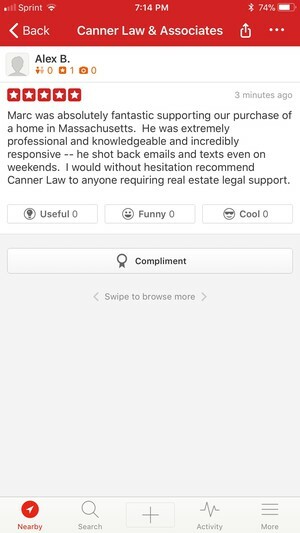 I would recommend Canner Law to anyone in the Greater Boston area. As you may know this is the second refinance we did with [redacted] and both closed at your offices and we had a great experience both times. Both my wife and I appreciate the professionalism your team puts forth and if we ever see our home value come close to the buy price we will be selling and downsizing and will absolutely retain your services. My husband and I have had the pleasure of working with Marc Canner both as first-time home buyers 6 years ago, and again with our second home purchase in 2012 and we would highly recommend him and his firm. He made the often complex process smooth and straightforward, and ensured we were on the right track every step of the way. We found him to be very responsive and always took the time to explain any questions we had. Marc is a detail-oriented, professional and punctual attorney. I have nothing but praise for his work ethic and have recommend him to my close friends and family members. Marc has expertly guided me through the closing process in a calm and expert manner. I have worked with many attorneys over the years. There are not many that make themselves as available to their clients as you do. I appreciate that “Crunch Time” support you have given me over the years. Clients really appreciate your protection of their interest and your ability to explain complex legal details on a level at which they understand. My wife and I just bought our first house about 9 months ago, and I was hesitant to refinance despite lower interest rates because of the hassle and generally negative experience we had the first time around. 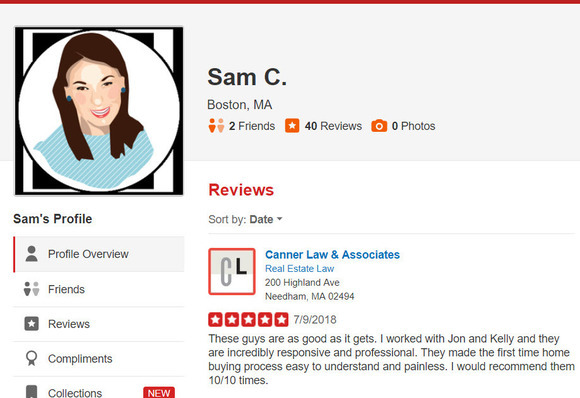 However, I am happy to report that things were a lot smoother this time around with the lender and the team at Canner Law, especially Kelly Bruce. Kelly was on top of everything and made sure things got done by the appropriate deadlines so we would not lose our "rate lock," which was no easy task considering that she had to clean up some items that hadn't been taken care of in connection with our initial home purchase. Just a note to thank you again for your services. My parents and myself appreciated the quality of you work in both reviewing the P & S/condo docs for us and in conducting the actual Settlement. Everything went so very smoothly and on schedule and my parents–who [unlike myself] are veterans of many real estate transactions–were very satisfied. As I said, I particularly valued your Real Estate Law Blog and its comprehensive and in-depth coverage of so many pertinent issues. It’s been an important resource for me in becoming better informed about real estate transactions, procedures, etc…in this last purchase but prior to it as well. I will not hesitate, going forward, to refer associates/friends/family to your services/practice.